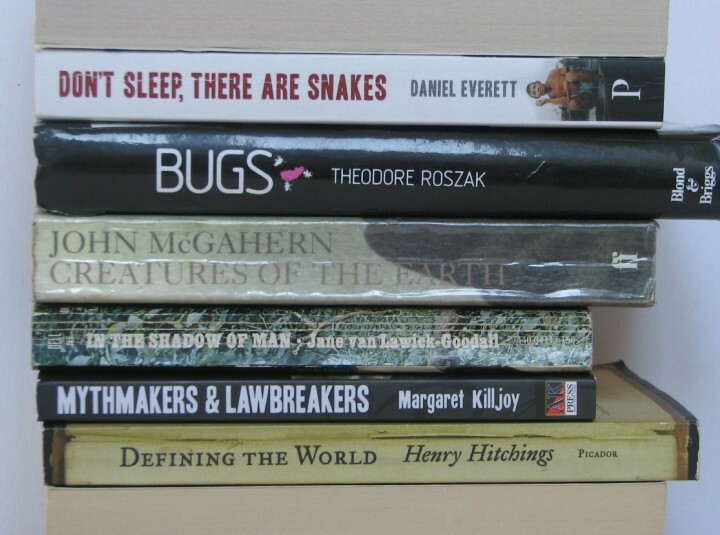 Bookmashing, for the uninitiated, is when you stack books so the titles on their spines form a poem, or a mini-story, etc. 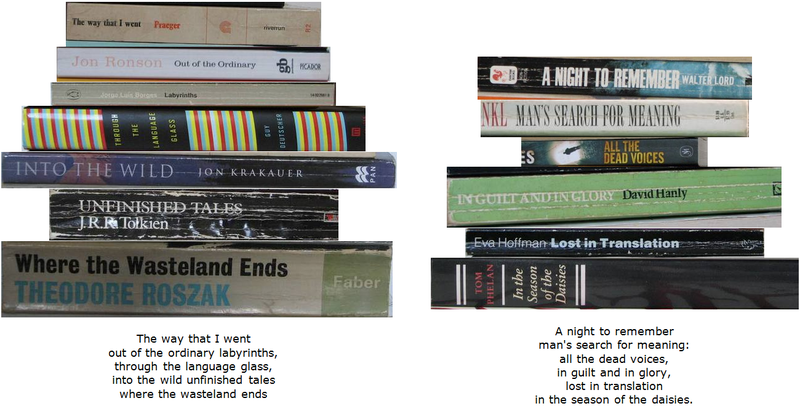 It also has the more transparent name book spine poetry. It’s a fun game – and challenge – for word lovers, and a great excuse to browse your bookshelves. You’ll see them in a new light. I got the idea originally from artist Nina Katchadourian, and it has spread to public radio and around the web. 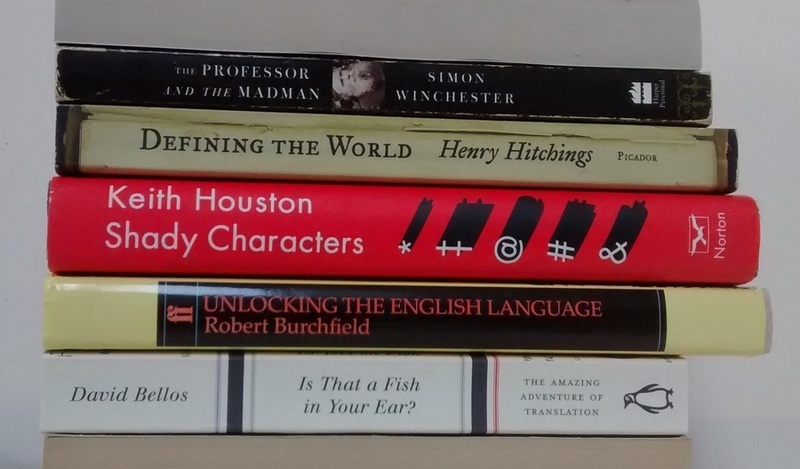 Last year a British drama group ran a bookmash competition, and now Jump! Mag (an educational magazine for children) is holding one for young readers. Millie Slavidou, who set up the contest, has put several bookmashes on her Glossologics blog, which I wrote about last year. Seeing the idea featured in Jump! Mag prompted today’s simple effort, and I look forward to seeing any competition entries they make public. New players are always welcome. Exclamation and question marks were not much used until the seventeenth century. Ben Johnson referred to the former as admiration marks, and they were casually known by the names shriekmark and screamer before exclamation mark became standard . . .
Admiration mark? Shriekmark? Screamer? Amused, I went looking for more and found that exclamation marks also went (and maybe still go) by the names shriek and Christer. The resulting tweet prompted a flurry of responses, so I want to extend the discussion here, where there’s more space. With thanks to the authors: Daniel Everett, Theodore Roszak, John McGahern, Jane Goodall, Margaret Killjoy, and Henry Hitchings; and special thanks to Nina Katchadourian for her Sorted Books project. Lots more of these in the bookmash archive, along with links to other people’s. Let me know if you join in, and I’ll update accordingly. Martha Barnette did me the honour of reading this bookmash aloud on A Way With Words, the public-radio language show she co-hosts with Grant Barrett. Adrian of The Outer Hoard had the marvellous idea of rearranging my older bookmashes to make two “stanmashes”. Olivia (@peeriepics) shared her first bookmash, evoking a nature walk in winter. 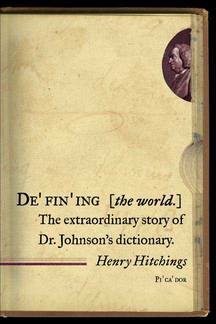 I recently read Henry Hitchings’s Defining the world: The extraordinary story of Dr Johnson’s dictionary, and I recommend it heartily to those of you who enjoy its principal fields of interest: words, history, literature, biography, and lexicography. As well as recreating the history of Johnson’s Dictionary, which was first published in 1755, Hitchings’s book serves as a frank and affectionate portrait of Samuel Johnson himself, and as a vivid profile of 18th-century England. It’s an elegant and enthralling account that includes a keen analysis of Johnson’s linguistic attitudes and shows how these developed over the course of creating his mighty work. Before beginning the Dictionary in earnest, Johnson wrote a lengthy Plan of an English Dictionary, in which he presented his ambitions for the book and his suitability for the task. It was addressed to the Earl of Chesterfield in order to win his patronage. Chesterfield, we read, was “obsessed with propriety of usage . . . and with embalming or even bettering the language”. Johnson said the dictionary’s chief intent would be “to preserve the purity, and ascertain the meaning of our English idiom”. The order of these aspirations is no accident. Johnson’s characterisation of English as “licentious” and “inconstant” has what Hitchings refers to as “a distinctly moral cast”. But although the emphasis on stability was “consistent with [Johnson’s] own political instincts”, Hitchings suggests that it was probably exaggerated for Chesterfield’s sake: years later the Dictionary’s preface would contain a sober and eloquent acknowledgement of the irresistibility of linguistic change. Linguistic conservatives like Chesterfield were afraid that unchecked changes in general usage would cause the English of the eighteenth century to become as bewildering to its inheritors as the language of Chaucer was to them. They were correct, of course, in seeing that their language was in flux. Then and now, the engines of this change include international commerce and travel, which involve contact with other languages; shifts in political doctrine or consensus; translations, which frequently preserve the idiom of their originals; fashion (in Johnson’s age, the nascent cult of sensibility), whose adherents require a special figurative language to articulate their refined and rarefied perspectives; and advertising, which uses foreign terms to connote mystique. These transfusions are what keep a language alive, but this is a modern view. Chesterfield could not begin to see that change was a force for the good. With time, Johnson’s conservatism — the desire to ‘fix’ the language — gave way to a radical awareness of language’s mutability. But from the outset the impulse to standardize and straighten English out was in competition with the belief that one should chronicle what’s there, and not just what one would like to see. The sixth edition of the Dictionary (1785) is available in multiple formats from the Internet Archive: Volume 1 and Volume 2. * My Tumblr blog has a short passage by Burchfield on semantic drift.